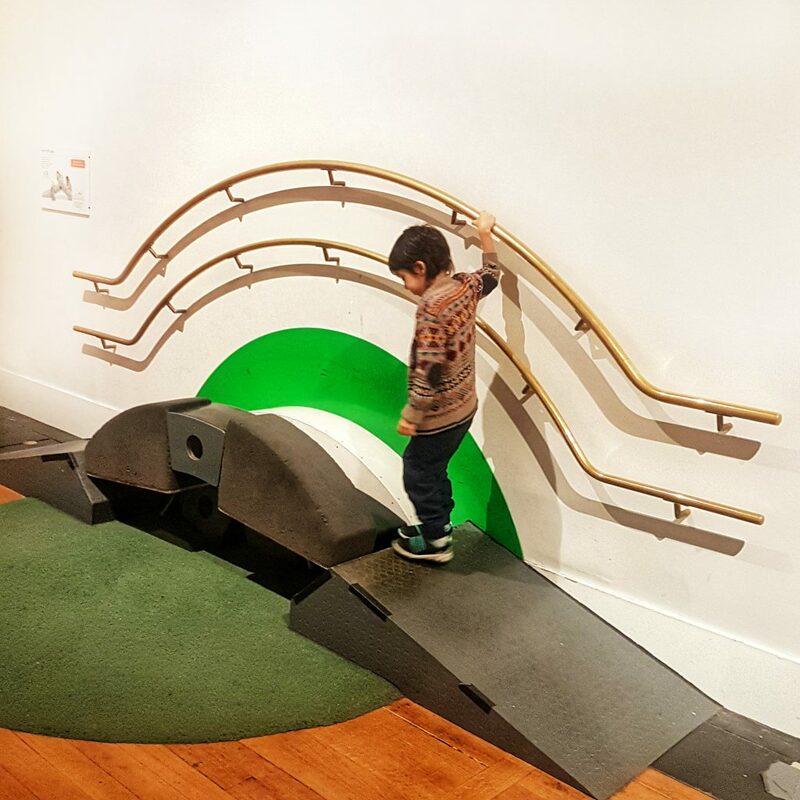 There are a great deal of museums in London where you can go with the kids and learn new things, play and explore. 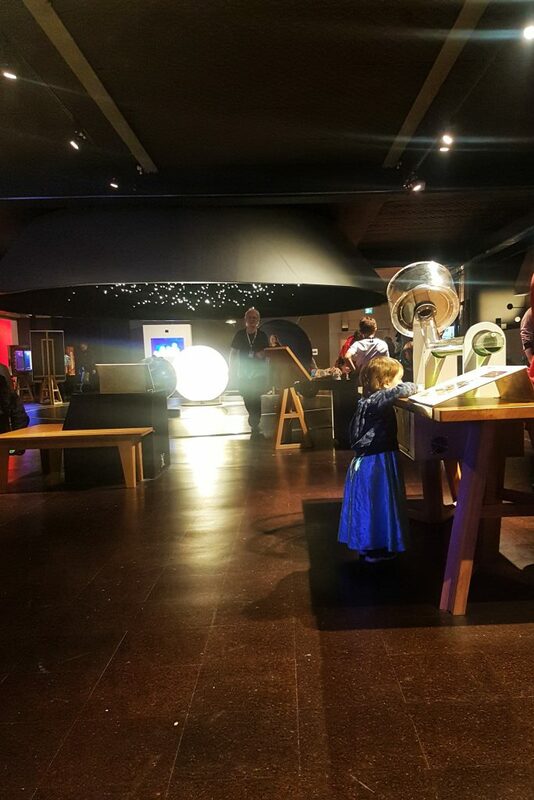 Science Museum is one of the best of them, and it’s amazing how many things you see and learn, and how there is something for everyone there, from babies to adults. 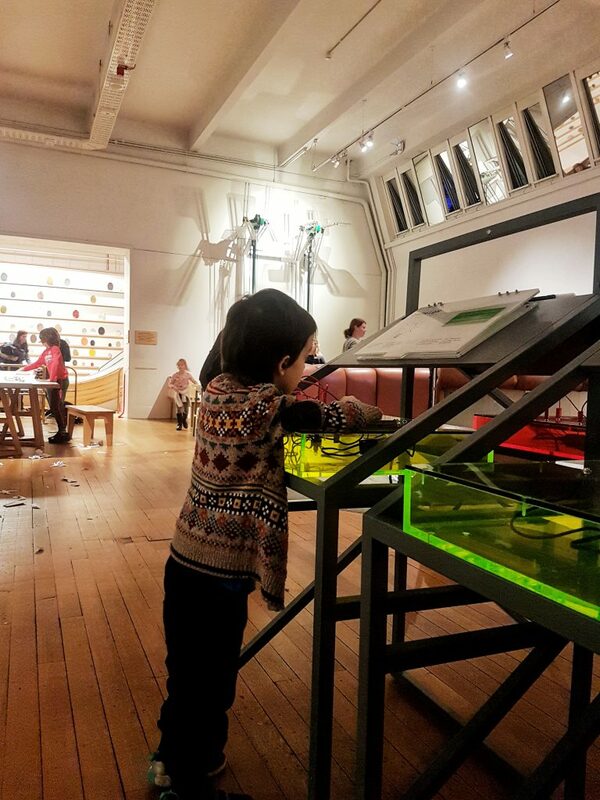 We have visited the museum several times, even before moving to London and having kids, but we have never been to WonderLab. That is until this week, when I decided it is time to explore it with the kids (my son is almost 6 years old, my daughter is 3.5 years old). 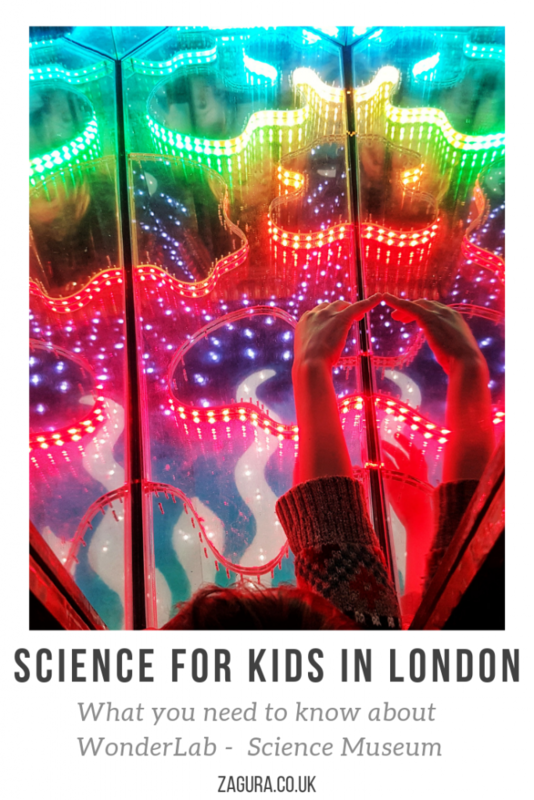 To better understand the photos in this post, I have to mention this: we got at WonderLab at Science Museum in London at 11am and they had to kick us out at closing time, at 5.45. During this time, we only had a lunch break for half an hour. Therefore, you will see photos with a very busy WonderLab, and also photos with fewer people around as it was almost closing time when I took them. 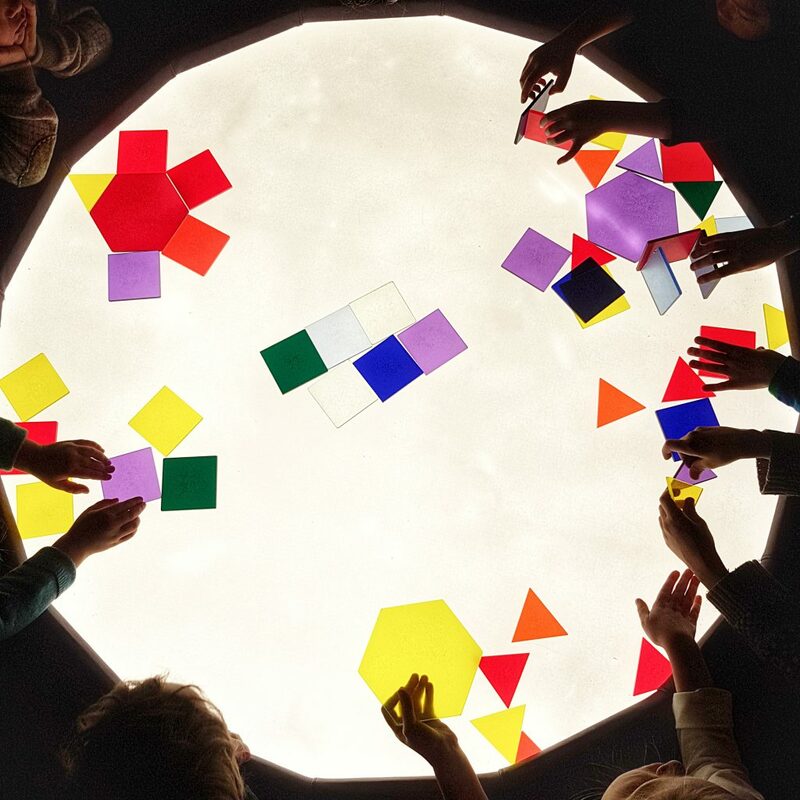 The whole space at WonderLab is divided into 7 curriculum-themed zones and I will talk about them below (approximately) in the order we discovered and explored them. I will also include a list with the seven zones (sort of a table of contents) so you can click on any of them in case you want to read about a specific one and skip others. So, I will start with the Light zone, as this is right next to the main entrance therefore it was the first to be enjoyed. This zone is amazing for experimenting with the properties of light. In this zone there is the Colour Room, a room filled with objects in all sorts of colours. The tricky part is that the room only has three lights (one at a time): red, green and blue. The challenge is to work out what colour the objects in the room actually are! And to check, you have 4 torches with white light at your disposal. Next to the Colour Room is a room with a reflective white wall against you can stay and have your “photo” taken: a flash goes off, with a countdown, and afterwards your shadow remains on the wall for a few seconds. It’s mesmerizing for the kids, to actually see their shadows on the wall after they have left the spot! 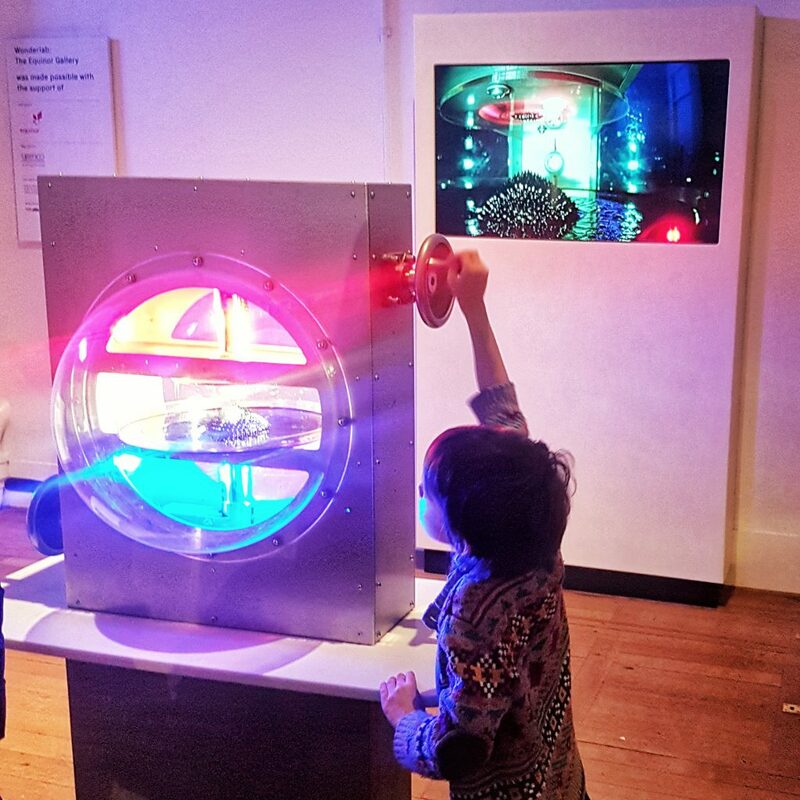 In the Light zone there are also hand-on activities, like this one below: using different coloured filters placed on this white light source, kids get to experiment how the filters block some colours and let others though. There is also a challenge for them: can they find out which filters to combine to block ALL the light? And when you manage to get the kids from the white light table (it will take a while! 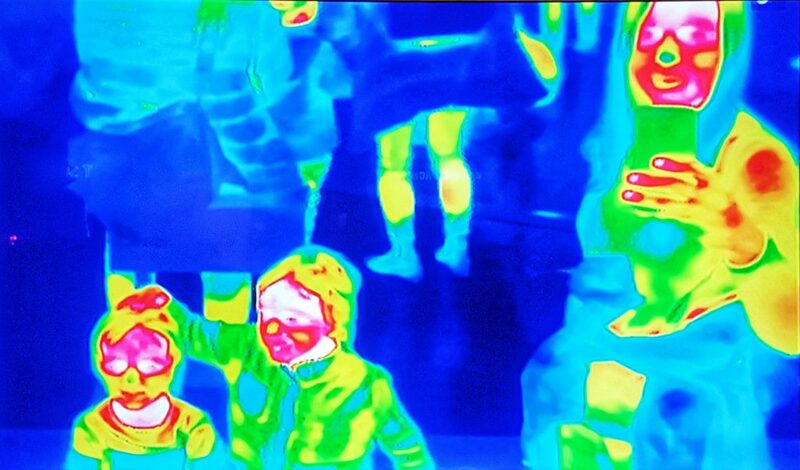 ), you can have fun experimenting with the thermal imaging camera. 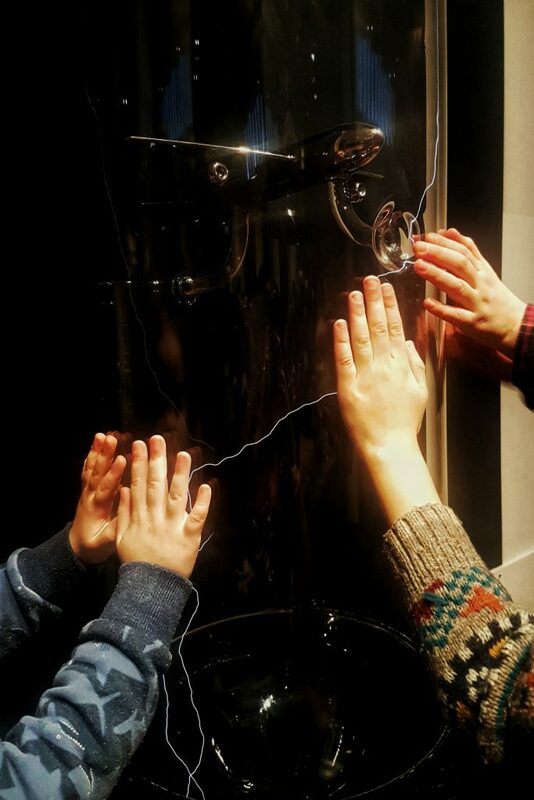 And the brilliant thing here is that there are 2 surfaces, one hot and one cold, and several cold metal bolts in different shapes, on which kids can place their hands, and after that, they can look on the screen and see the colour of their hands. And the next photo is of the Infinity Mirrors: when two mirrors are placed opposite each other with an object in the middle, multiple reflections from the original object are created and they seem to stretch off into infinity. 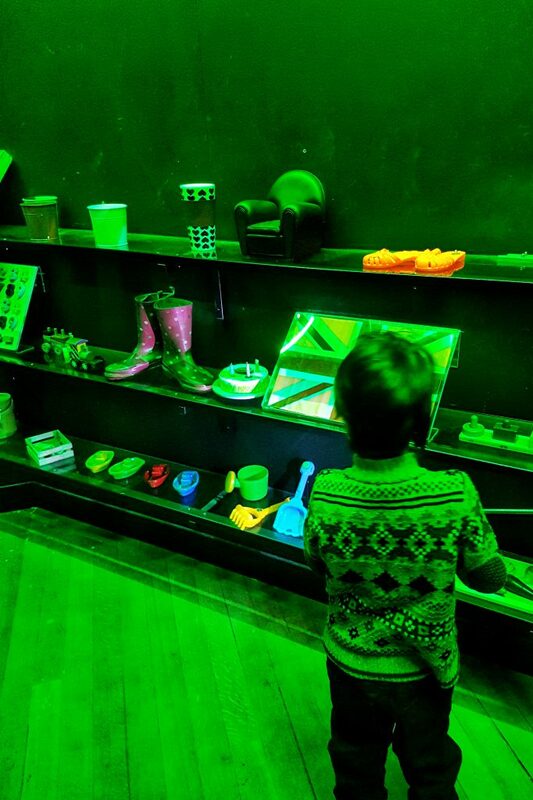 In the Light zone there are also an area where kids can combine coloured lights to see what happens and an area where they can experience what it’s like to walk inside a light beam. Once we had played with the light, we moved on to the next themed zone. 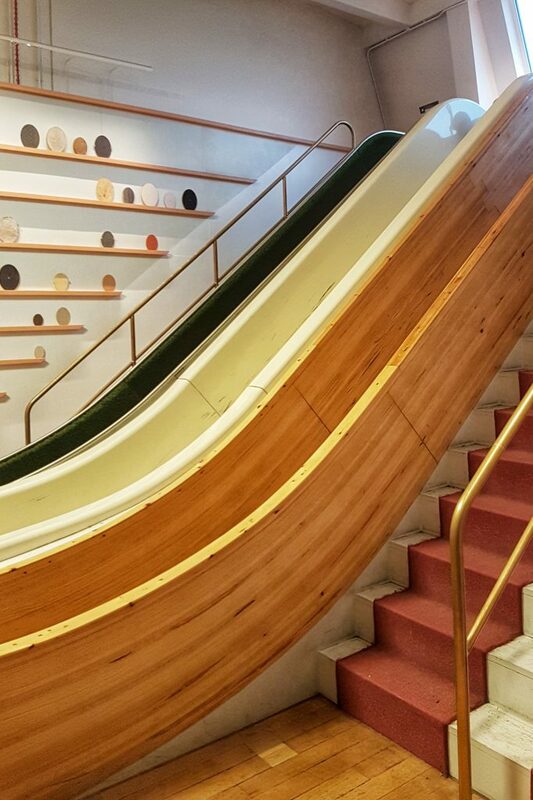 And the first thing that caught my kids’ eyes were the slides. 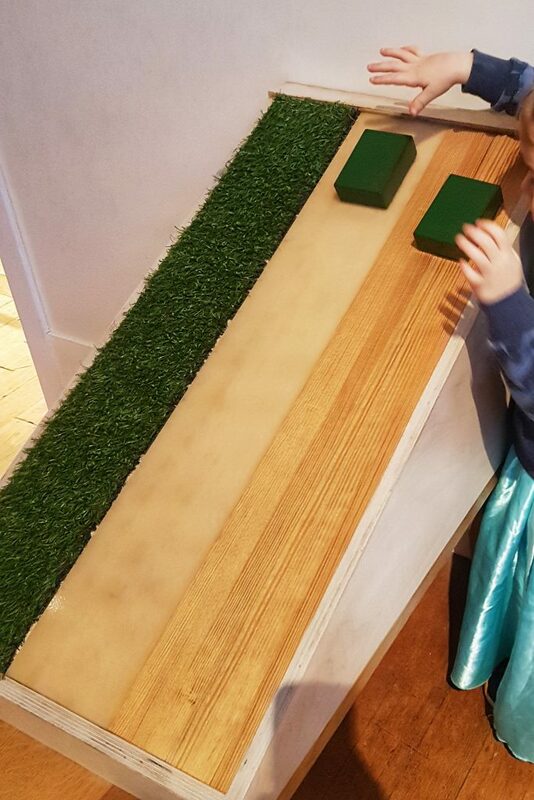 The friction slides to be more precise: there are 3 slides made of different materials and with different surfaces, and the kids have the mission of finding out through going down each slide, which one has the most friction. This area is designed for kids over 1m height, just so you know. And during busy times there is a queue so there are sessions of 3 minutes each with 6 kids per session. 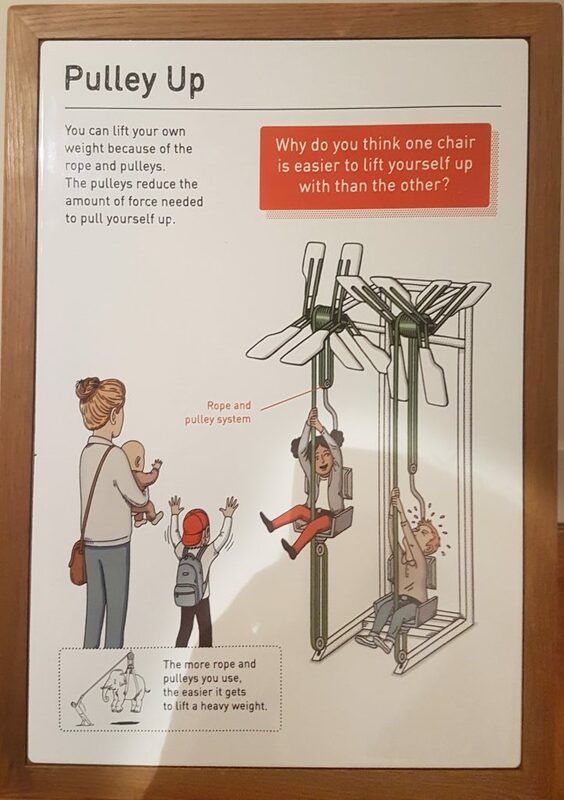 Next to the slides are these pulleys, two of them, where kids sit in a chair with a seat belt on and they try to lift themselves up. 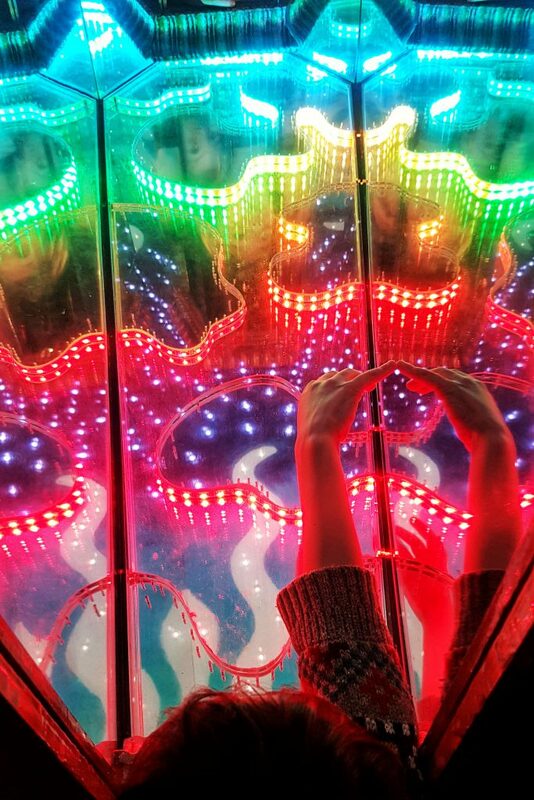 The kids loved going up and then down and up again, the only thing that made them stop this was not the queue, as they had their go before closing time, but my back, which was hurting from all the pulling, as my daughter couldn’t pull herself up. 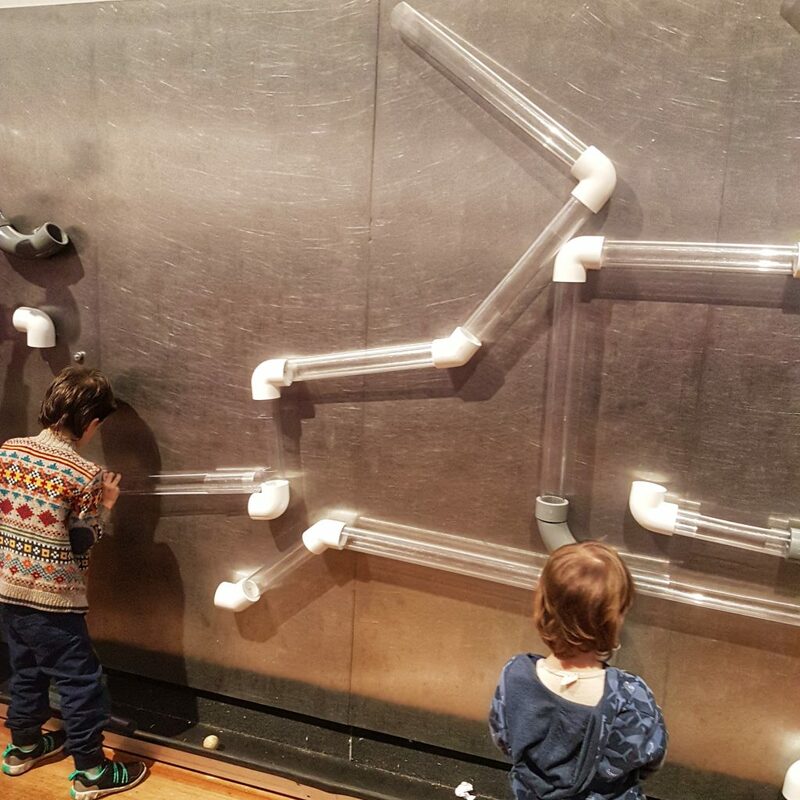 And in case you have at least one child who loves marble run games, consider yourself warned: this magnetic wall with pipes and balls will be heaven! There are lots of pipes, and it’s a team effort to create the greatest, the longest, the coolest gravity ball run! We spent here a lot of time… a lot! Team effort is also needed to build a strong structure as a bridge. 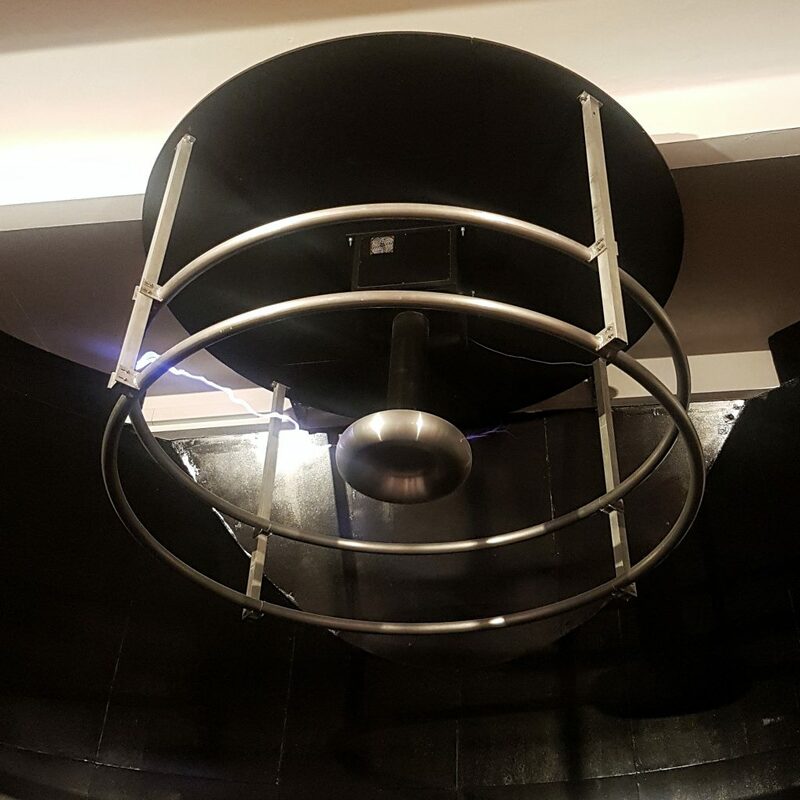 And in the same zone you can find the Air Cannon so kids can understand through a hands-on activity why they make their lips narrower when they blow their birthday candles. While in the Forces zone, you will hear loud noises from the Electricity zone: that’s because there are shows which are announced on a black board. And yes, this is the next themed zone we explored at WonderLab. Look at the tree trunk below. How cool it is? It has magnets stuck to it, and there are lots of metal pieces around it with which children can experiment and see which ones become magnetised, and then make their own magnetic work of art. Next to the tree trunk is the “Lightning Strike” which lets you touch a tube with lightning inside. And you and the kids are safe! And when you place one hand on the tube and with a finger from your other hand try to touch someone else’s hand… bzzzz! It’s so cool! It’s amazing for the kids to feel that in such a safe and fun environment! The center piece of the Electricity zone is the Electricity Demo Show you’ll see both a Tesla coil and a Van de Graaff generator in action. Pure powerful lightnings! It’s just amazing to see this live! Just a warning though in the area: the sound is loud, and also, visitors with devices like pacemakers will be required to stay at a certain distance from the area (the staff doing the demo show will share all the details and warning so that everyone is safe). Can you see the lightning in the next photo? 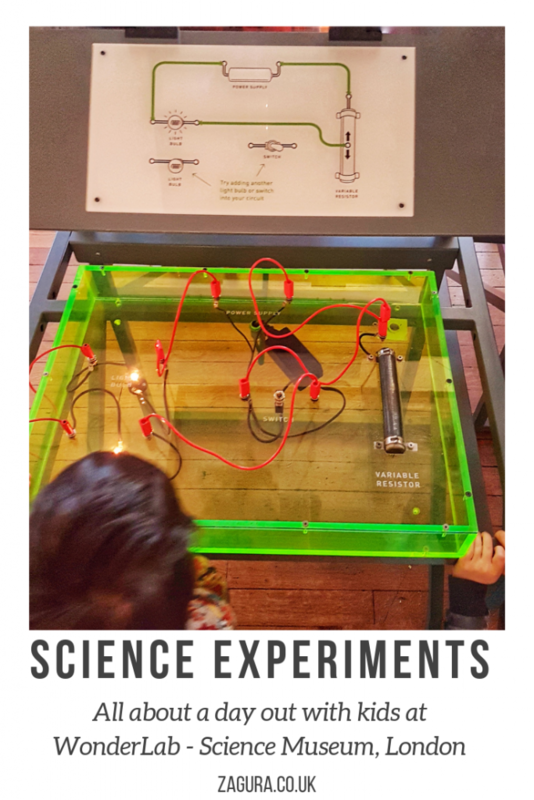 Electricity travelling across the ceiling in the Tesla coil and Van de Graaff generator. 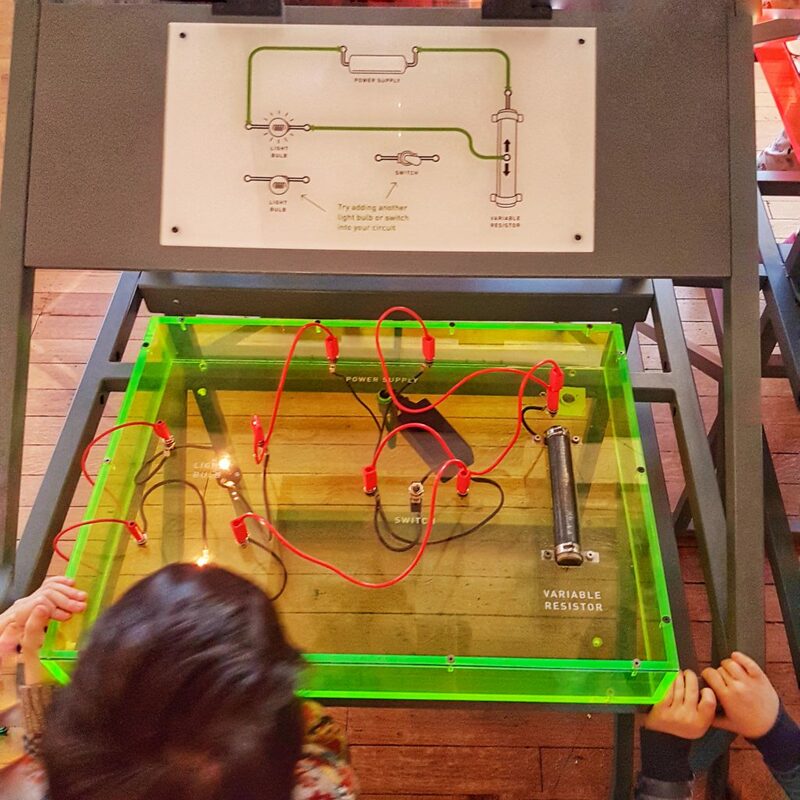 Another show that took place, this time in the showspace, was about electricity and humans use of it: how it is created, what a circuit is and what and which materials will conduct electricity. We had been to the circuit area before the show, but after the show the kids asked to return to it, so we all had fun with the Circuits exhibits that let you build circuits to turn on the light (my kids played with those), set up a burglars alarm (my son did that one) and set up a hand dryer (the circuit had 3 fans and sensors, it was so cool! Reminded me of my University days). At 6 years of age, I think kids get the idea/concept of a circuit, especially when they play with wires and lights like this. At 3 years of age, they don’t yet care, but they can still have tons of fun mixing the wires and when accidentally the light turns on, it’s like an Evrika! moment. I have to mention another challenging activity that is in this area, though I have not taken photos of it:the Floating Magnet. 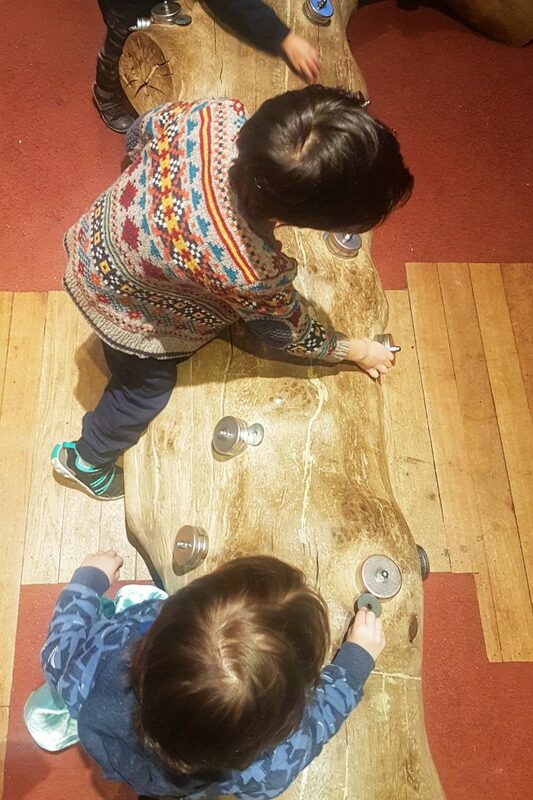 The concept of eddy currents is a bit too much to grasp at 6 years of age, but kids still had fun trying to manoeuvre the inside magnet with another magnet and get it to levitate. 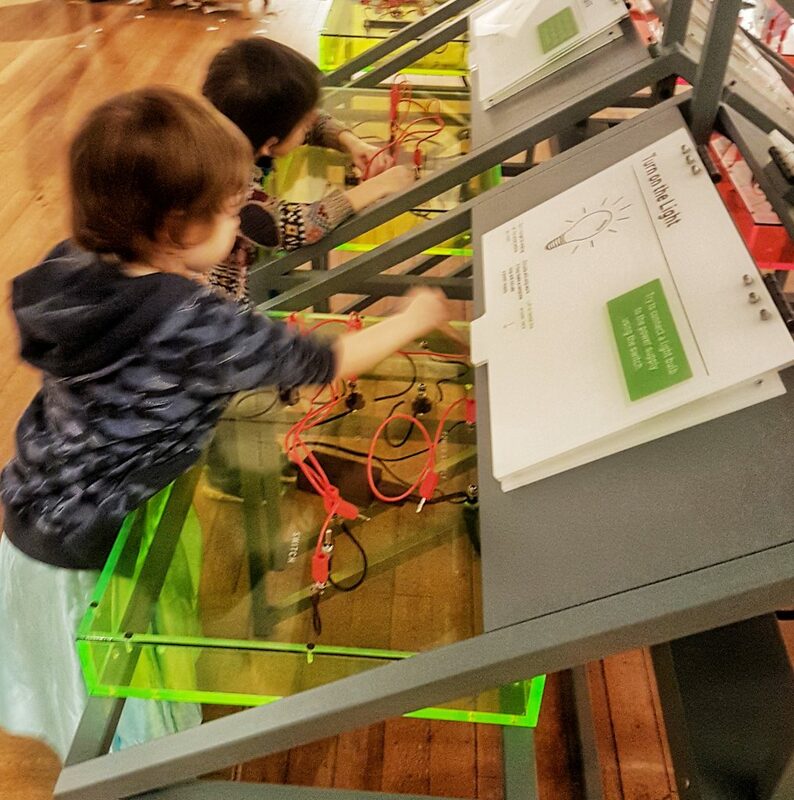 At some point of our day out at the Science Museum, we reached the Maths zone of the WonderLab (I had lost track of time at this point!). And here we discovered the pendulums! The fun thing about them was that there was this pen attached to one of them, and a piece of paper placed on the other. And this is how, by the swings of the two pendulums, swirling patterns were created. 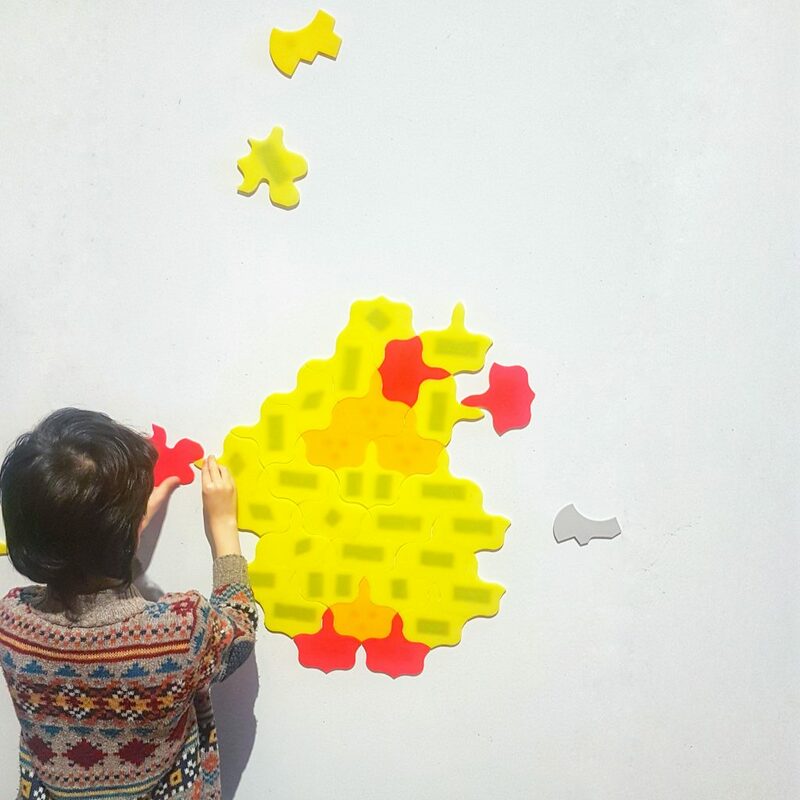 I am sure my kids can’t remember the term “tessellation” at the moment, but they had a lot of fun at the Tessellation Wall, which is all about making patterns with shapes placed together on a flat surface so that they have no gaps or overlaps. And the Shape Maker? 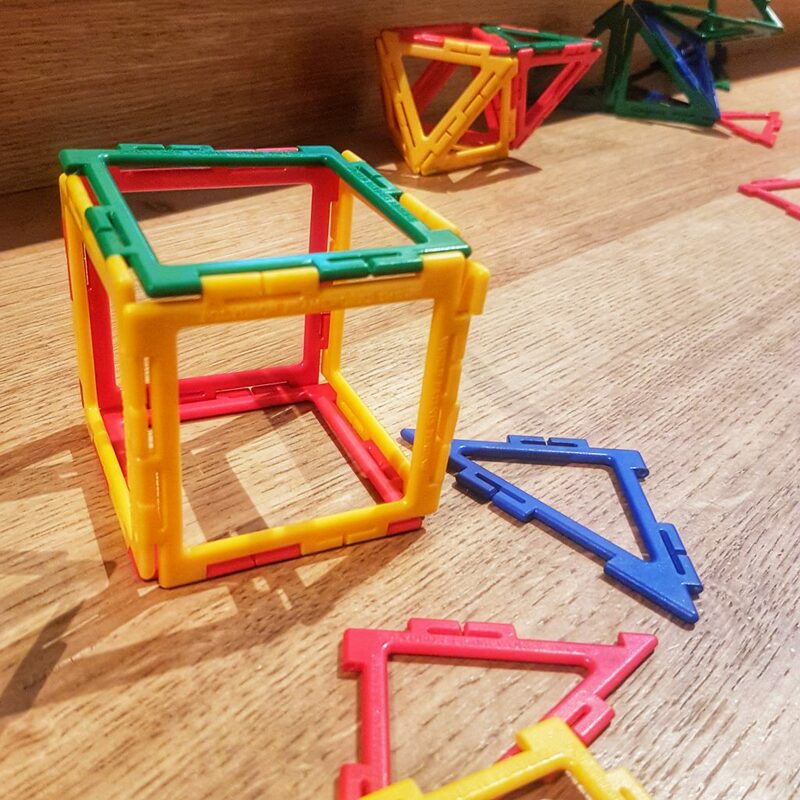 Another hit, as children can play with 2D and 3D shapes to create anything. As they say, imagination is the limit! 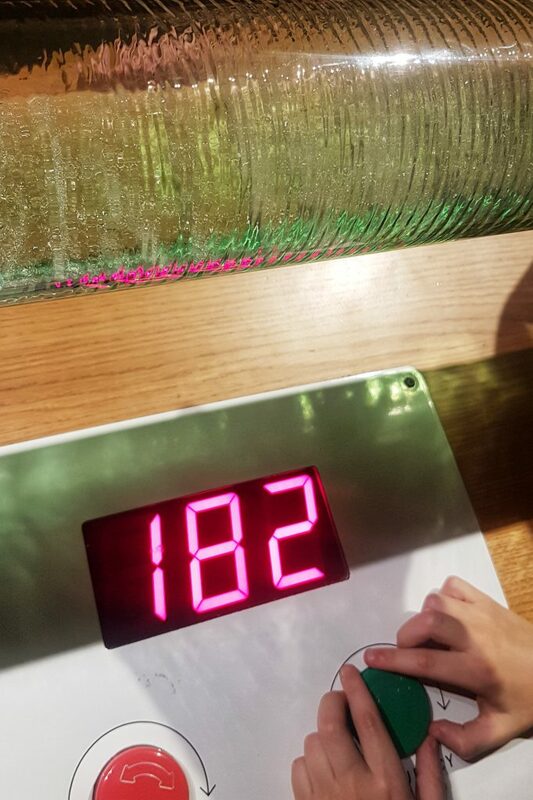 Oh, and another fun game we played in the Maths zone was the Water Jet Challenge: there is a water jet that launches a stream of water into the air and you get to decide the angle of the jet and when it should be launched in order to hit a light. 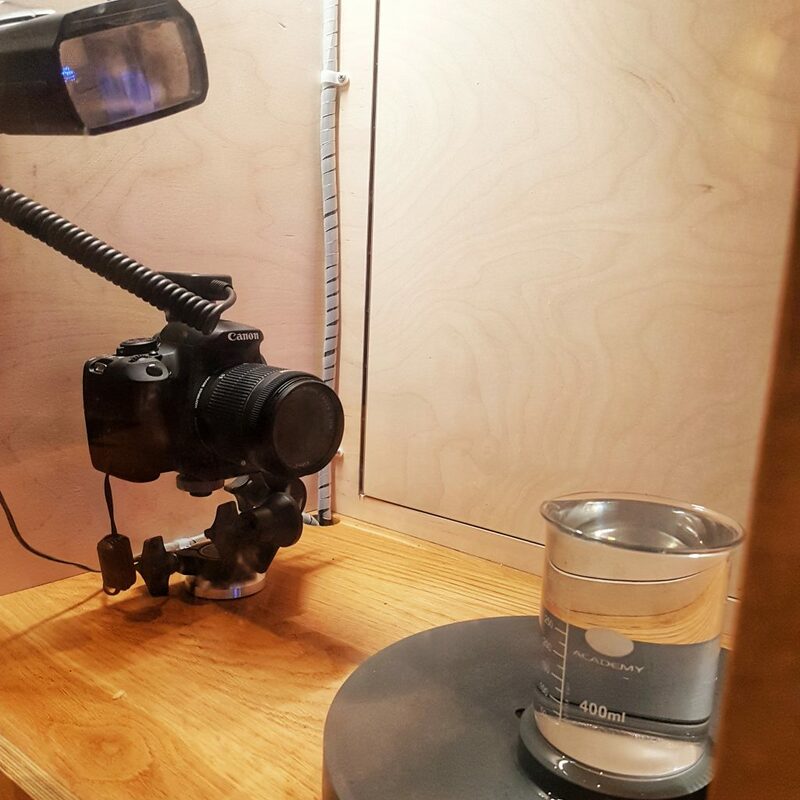 Which light changed its position with every challenge. Yes, this is a perfect activity for kids who love to be challenged. In the photo below, can you spot the Earth? Yes, this means the huge while ball is supposed to be the Sun. There is also a Moon orbiting the Earth. My son had a phase in which he was fascinated by anything related to space, and he loved to actually stay next to the Earth, notice the Moon going round it, while actually travelling around the Sun. This model also helped my daughter grasp the idea of Solar System better. This is a great area in the Space zone. 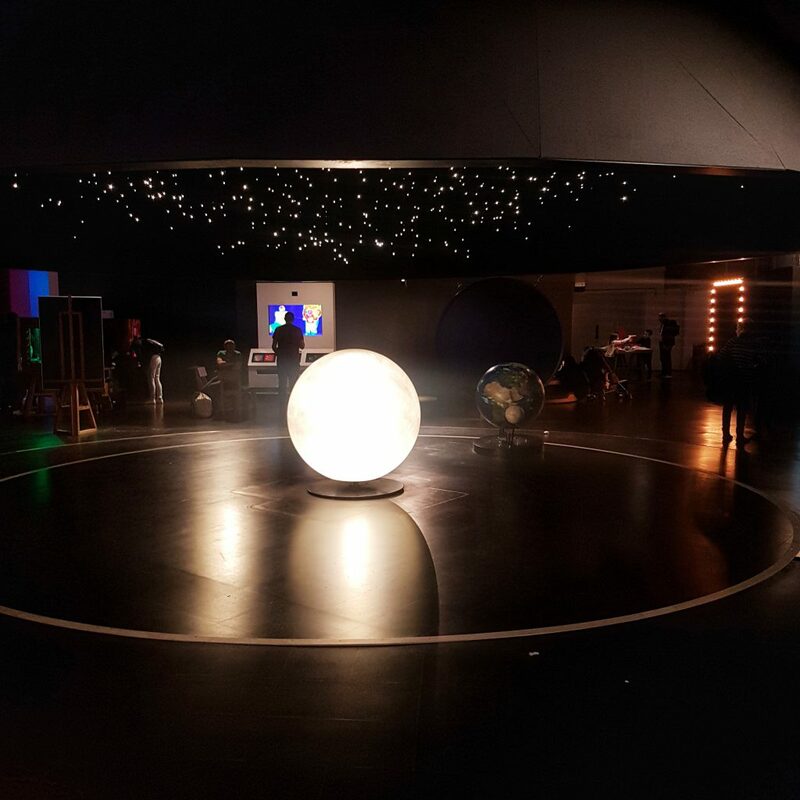 The next area is about this: when you roll a ball around the Double Gravity Well exhibit, it behaves in a similar way to a planet orbiting two stars. Depending on how you release it, the ball will roll in a particular orbit shape before it eventually falls into the hole. I noticed that older kids had a particular interest in this area, which seems natural as these are not concepts for young children. 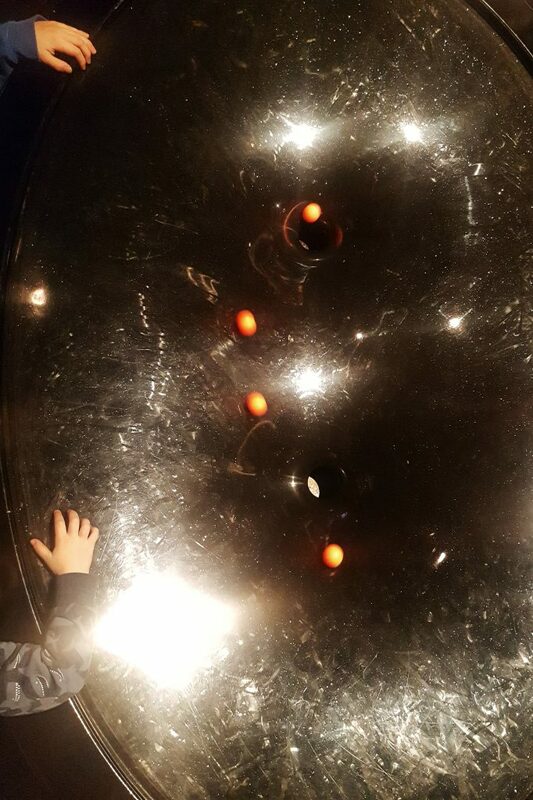 Still, my kids loved playing with the balls and watching their trajectory. 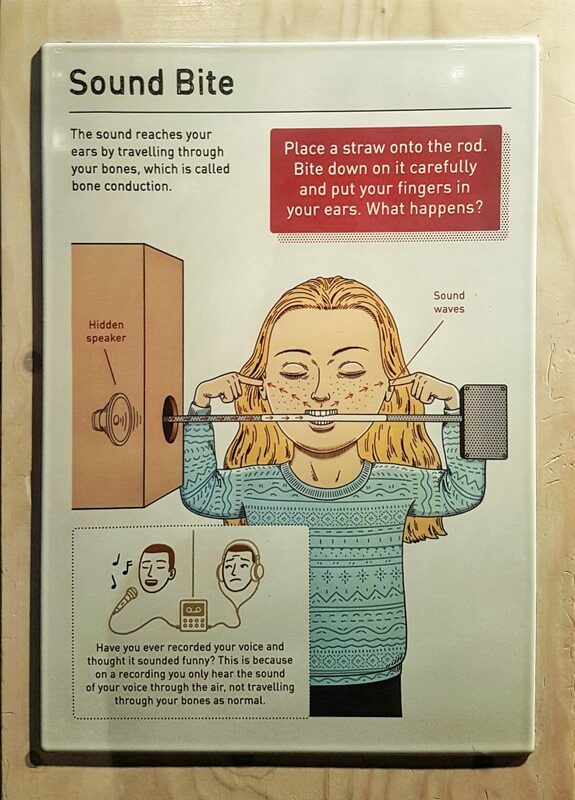 It took us a while to get to the Sound zone, as it’s closer to the exit, but I was so glad when we did, as I got to experiment the Sound Bite! And I loved the music to be honest! The kids were mesmerized, “What? How can I hear through a straw in my mouth?!? !” Well, honey… you can! 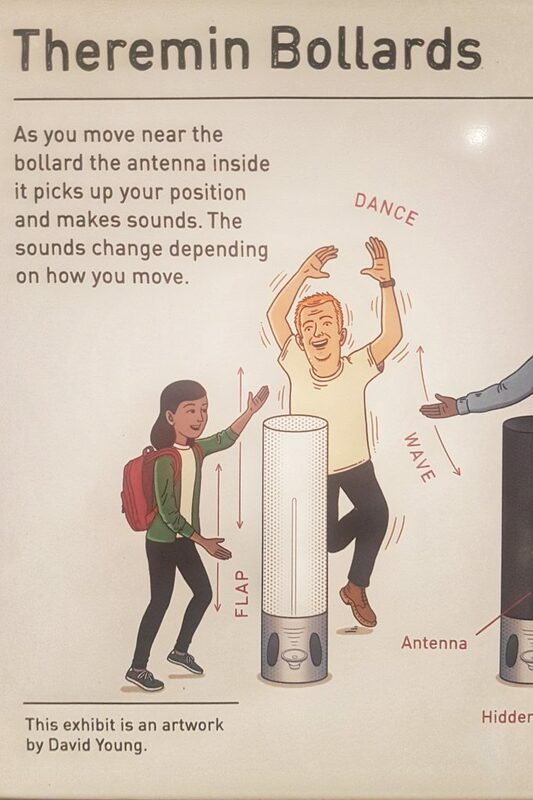 The Sound area is the one where, if you feel like dancing, you can actually do it, around the Theremin Bollards! 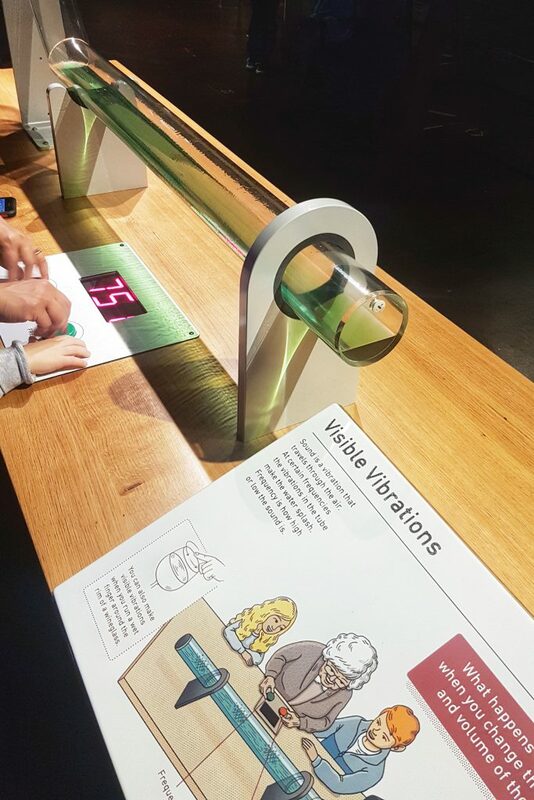 And while dancing, you will spot this: the Visible Vibrations, where children get to control the volume and the frequency to try and get the vibrations in the tube to make the water splash. Maximum of volume and the frequency set to 180 makes this happen. But there is another frequency that works! Tell me if you’ve found it, in case you visit WonderLab! Again, in this area the Pod and the Echo remained unexplored for a future visit but we did manage to play with the Waves, meaning strings attached to motors: as the motors turn they cause the string between them to spin. 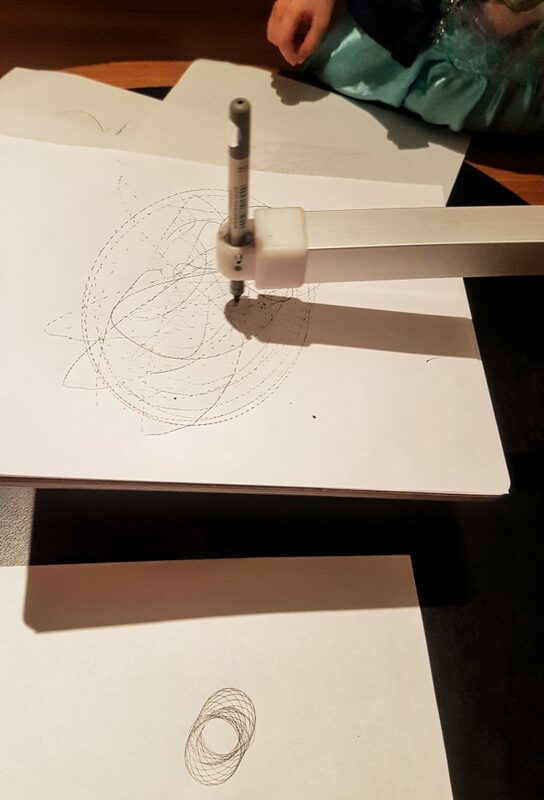 The spinning string makes different wave patterns depending on whether the two motors are in sync with each other or not. Children can also hear the sound the strings make and how it changes depending on how they control the motors. The photo below was taken at the entrance but it is part of the Matter zone, which was the last to be explored by us. Can you guess what’s the next photo? I asked this question on my Twitter account as well, mainly because I love this photo and I wanted to share it there. 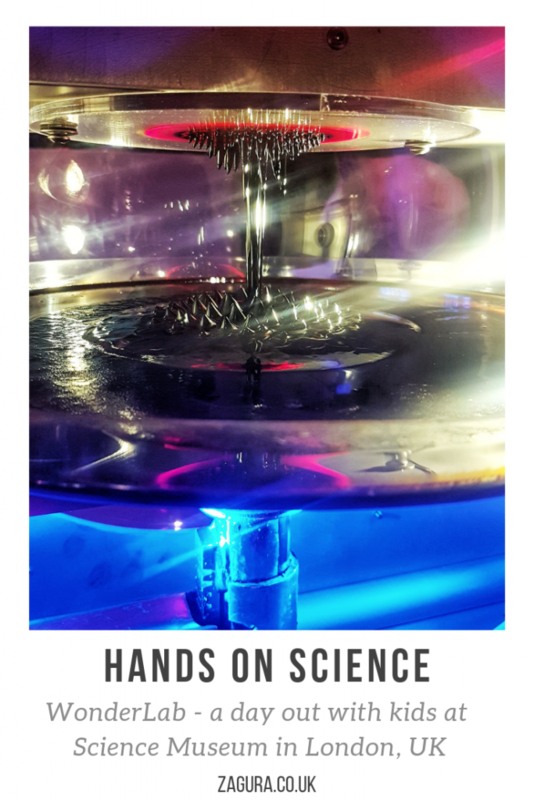 It is Magnetic Liquid which contains a special material called a ferrofluid, which is made from magnetic material that has been ground into an extremely fine powder and suspended in a liquid. It has been invented by NASA in 1963 (source). 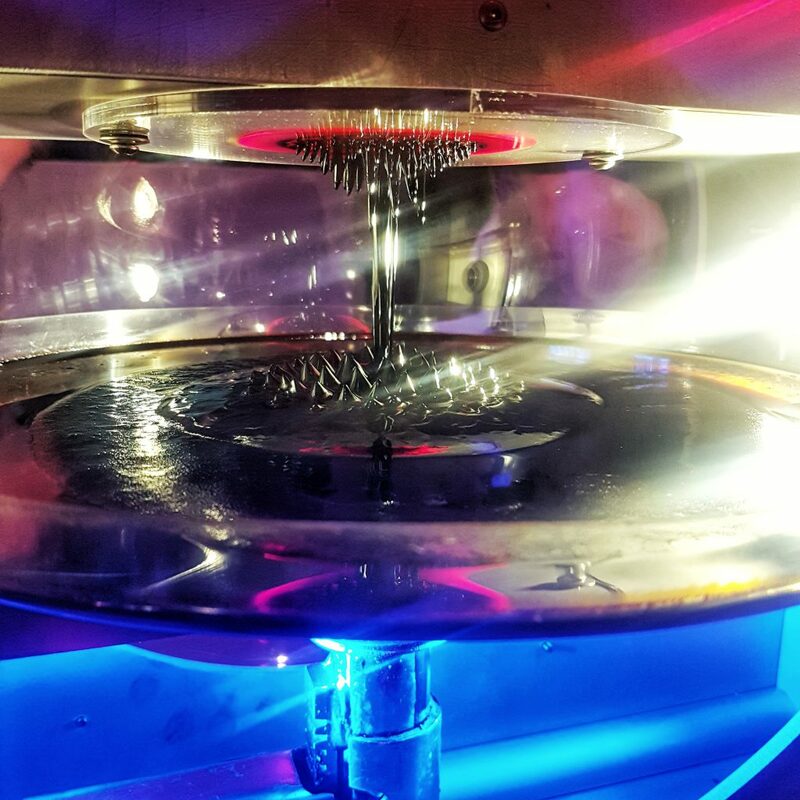 And when you have magnetic liquid on a plate, and underneath it you place a magnet, and above it another plate and behind it, another magnet, you get some really cool and interesting shapes! 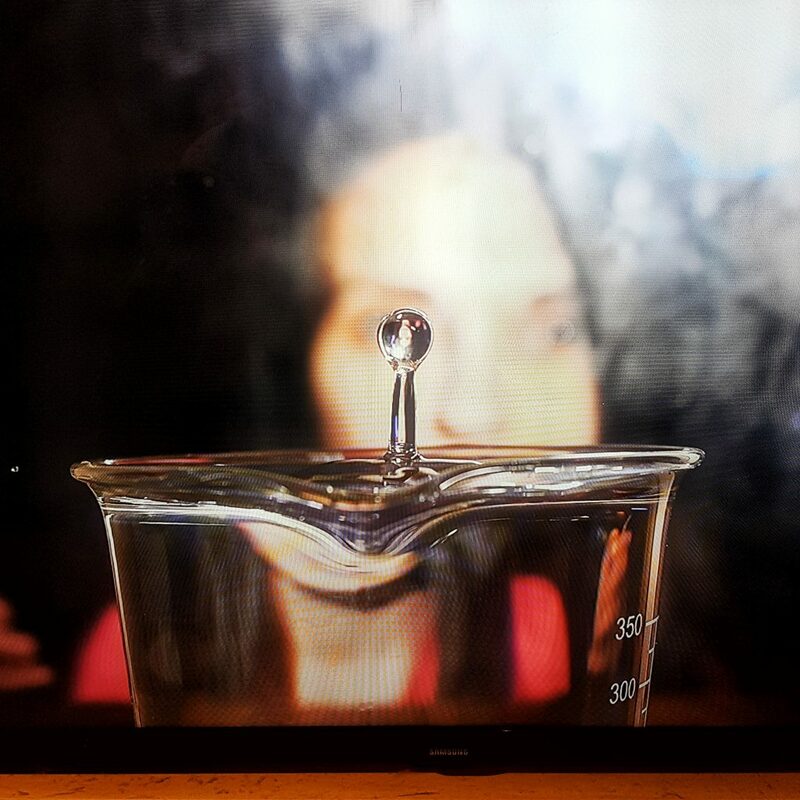 Another amazing thing in the Matter zone is the freezing water: there are big magnifying glasses so you can have a loot and watch the changes of state of both freezing and melting. Just look at the photo below, isn’t it amazing? 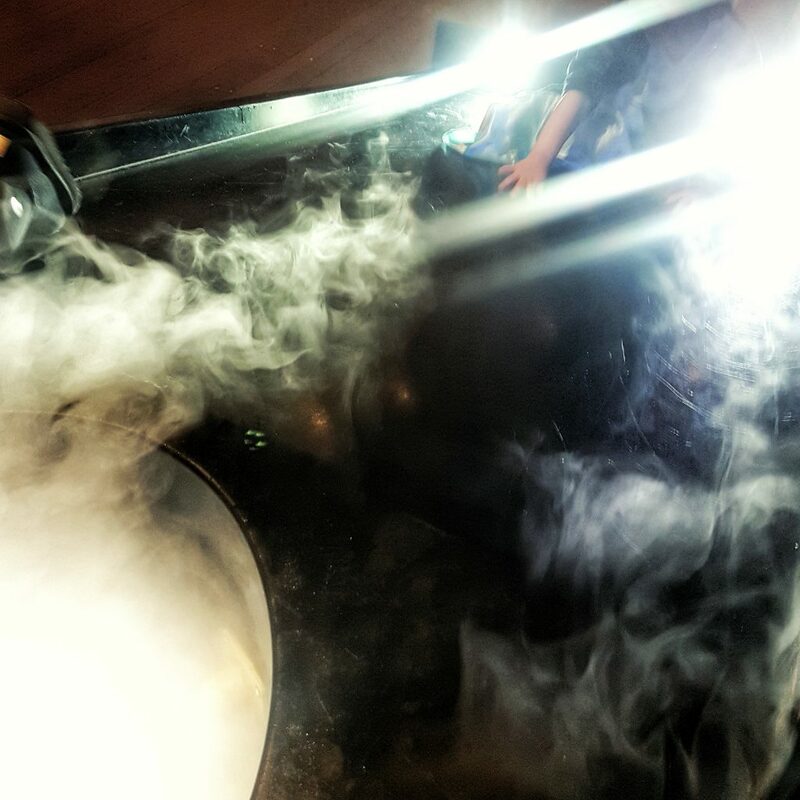 Still in the Matter area, here we have Dry Ice! 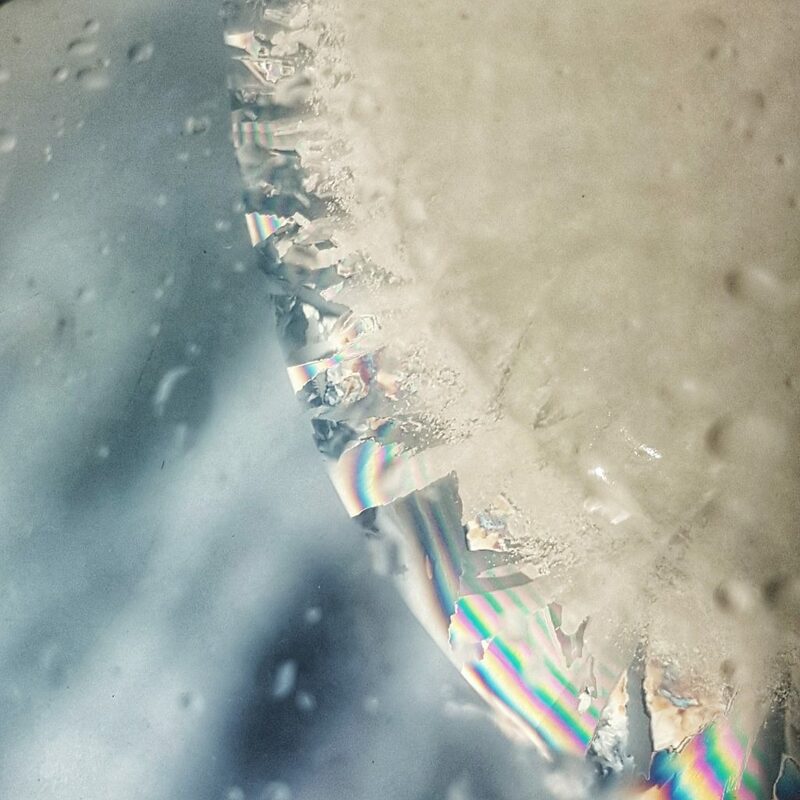 Yes, it’s ice, and it’s dry, because it’s carbon dioxide which, when frozen, turns straight into a gas when their solid form is heated. The process is called sublimation, and it is mesmerizing for kids, I am telling you! We visited this area three times while we were there! In case you are wondering what you are looking at in the next photo, it’s the Flowing Mist. It’s mist, it flows downhill, and it’s fascinating. And it’s close to Cloud Rings where a pool of smoke is created in a central chamber. When you push down on the top part of the chamber this causes the gas to flow out of the narrow opening. 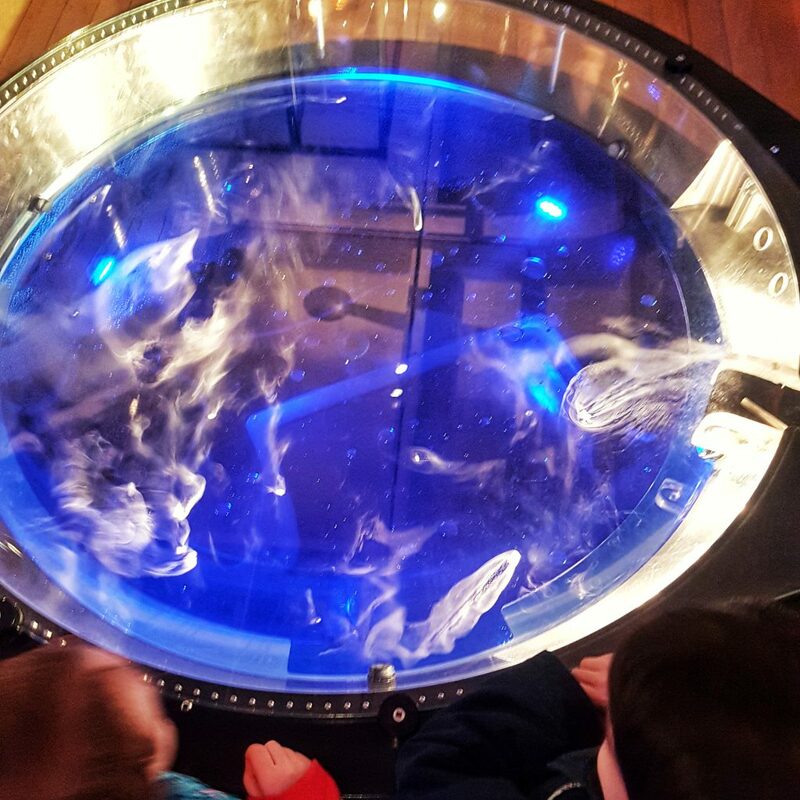 If the smoke is pushed out of the opening quickly enough this causes smoke rings to form, which travel up to the ceiling. 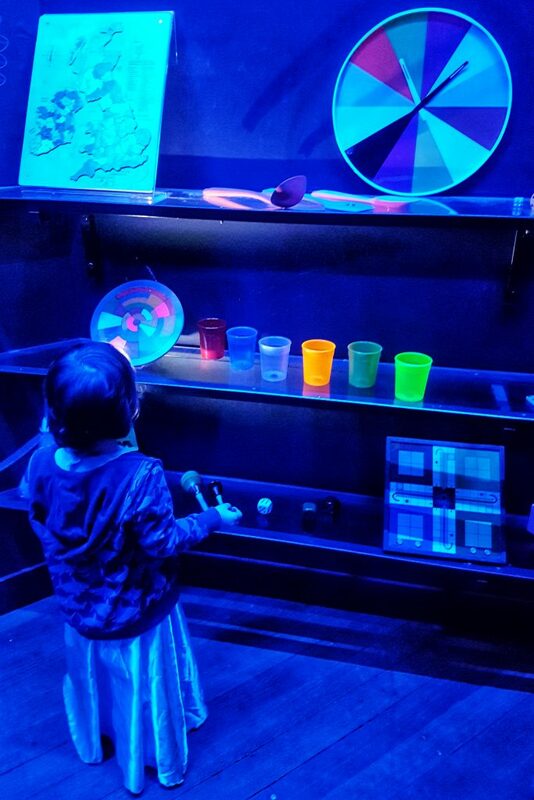 And this is the end of our adventures at WonderLab, Matter being the last thing we experimented before turning the light off when leaving the place (figure of speech, the staff turned off the lights behind us). 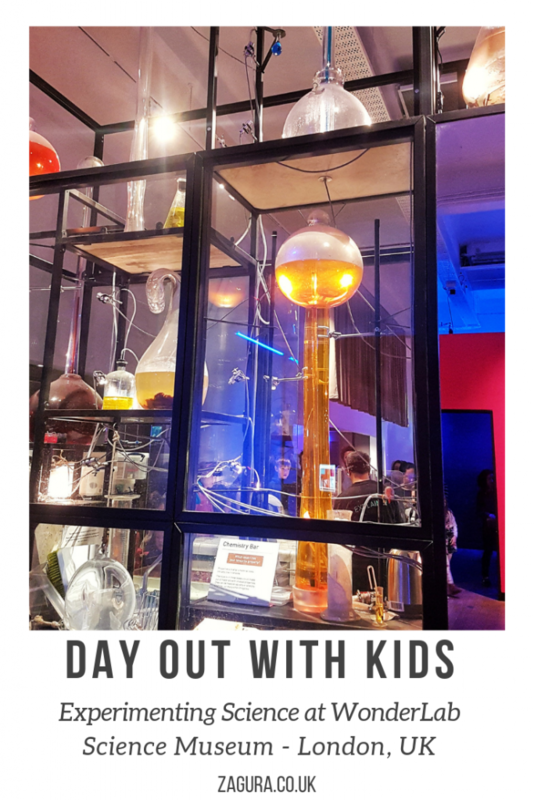 It was an absolutely lovely day out with the kids at Science Museum and I strongly recommend visiting WonderLab, with or without kids. Before ending this post, I want to write here some tips that you might find useful in case you plan a visit (and I strongly recommend it!). but no matter when you arrive, prepare yourself to be there until closing time! 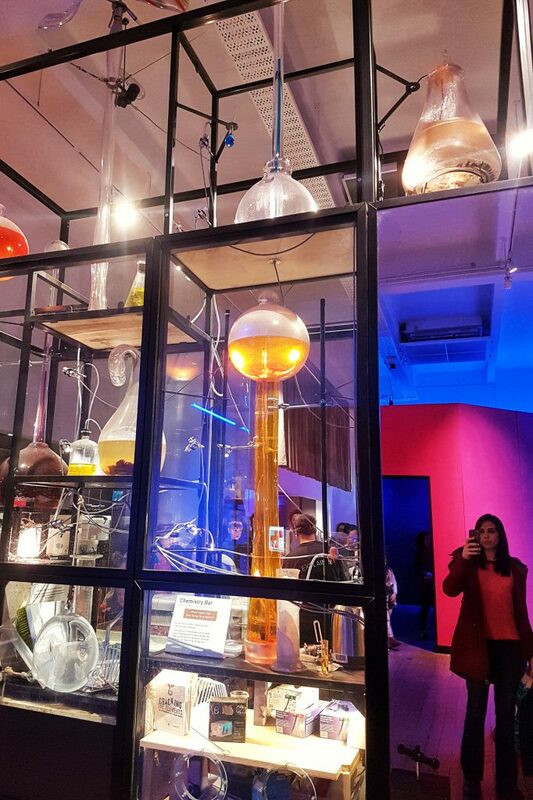 Have you already been to WonderLab? Share your experience (plus any tip you might have!) in the comments below, I’d love to hear about it! Yep, so many museums to visit, so few hours in a day! 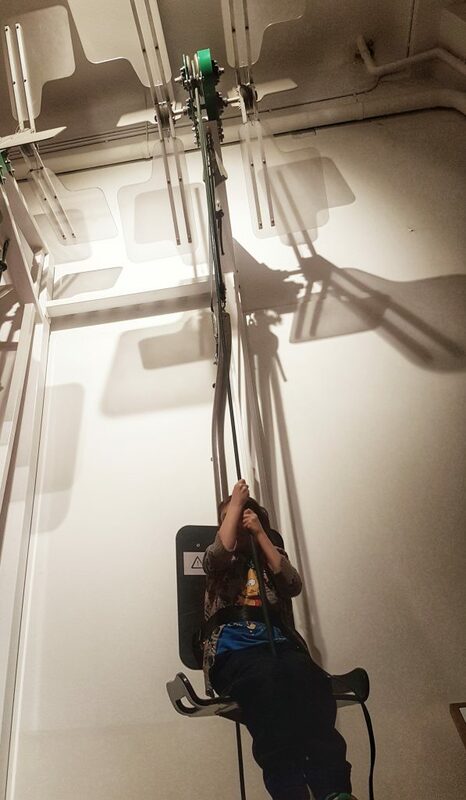 Glad to hear you really stayed for their entire open hours so the kids could soak up the vibe of the exhibit / museum! I would assume most visitors are merely passing through, staying an hour or two at most, then never to return again. The importance of a second return is constantly overlooked / missed by most. (Doesn’t this apply to all things in life though? hehe). So yes, do return, and spend a full day exploring these missed areas. Don’t forget to follow up at home (by building something perhaps?) on a display / subject that a kid really gets excited about!